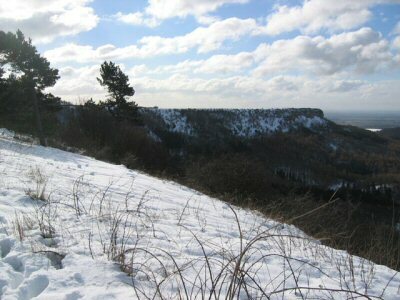 Sutton Bank as the name suggests is a massive ridge with fantastic views of moorland scenery. On a clear day you can see for miles. It's famous for the chalk carving of a white horse within the bank which I have to say is impressive. The pub is known for amazing ice-creams too! Sutton Bank (or Roulston Scar to give its precise name) is in the county of North Yorkshire in England. It is a high point on the Hambleton Hills and the North Yorkshire Moors with extensive views over the Vale of York and the Vale of Mowbray. The hill is the site of one of the most important prehistoric monuments in the region: a massive hillfort built in the Iron Age, around 400 BC. Because it faces the prevailing westerly winds, Sutton Bank has been used for ridge soaring since the early 1930s for the sport of gliding. The Yorkshire Gliding Club is based at the top of the hill. At the foot of Sutton Bank lies the village of Sutton-under-Whitestonecliffe, at 27 letters long, it has the longest placename in England. The A170 road runs down the bank and vehicles have to keep in low gear whist travelling up the bank.